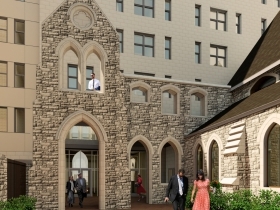 An old church has new life in downtown Milwaukee. 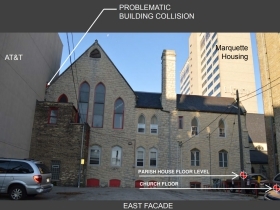 Developer Joshua Jeffers secured approval Monday afternoon to convert the former St. James Episcopal Church at 833 W. Wisconsin Ave. into an event venue and develop an apartment building on the site by partially demolishing the former parish house. Jeffers hopes to begin construction work on the project this summer, with the apartments opening in late summer 2019. The venerable protestant church, originally constructed in 1867, held its last service on November 1st, with the congregation folding at that time. The building, historically-designated by both the city and federal government, has been listed for sale for a number of years with an asking price of $695,000. With dwindling membership, the congregation could no longer afford the expense of maintaining the large facility. 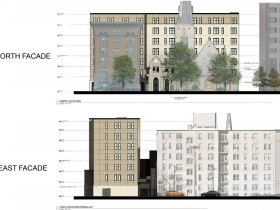 The key to the whole proposal is the partial demolition of the parish house and the addition of apartments. The parish house, attached to the rear of the church, was built in 1899. “For us to convert the 1899 addition into something that is both historically accurate and built to modern code compliance, it would be enormously costly… This building has more asbestos in it proportionally than any other building I’ve seen,” Jeffers told the commission in December. 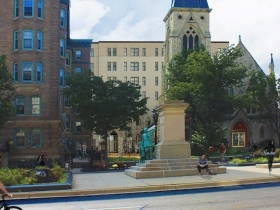 The signature hall from the parish house, and the building’s north facade facing W. Wisconsin Ave., would be preserved and installed at the base of a new seven-story apartment building. Joining the hall in the base of the building would be a series of event support facilities with 35 apartments planned for the building’s upper floors. Oliver Hunt of Hidden Kitchen MKE will operate the event venue, utilizing the preserved church and new building. 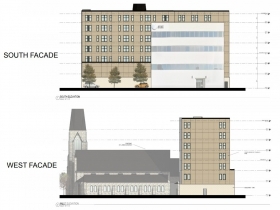 “All I want out of your building, as much as we like good, high-quality architecture, is to be a backdrop to this beautiful church,” said commissioner Matt Jarosz. Ernst has designed the building to be just that. There are no balconies or attempts to visually overpower the church. 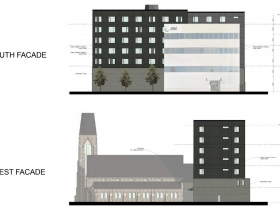 Instead, the new, 82-feet-high building will have a flat facade that is intended to guide the eye towards the 42-feet-high stone church. The site has quite a history. 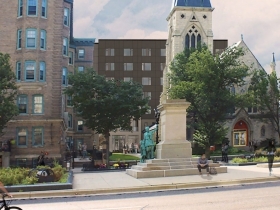 The first church on the site was built atop the Spring Street Burial Grounds in 1851. After building a new church on the site in 1867, a fire gutted that building on New Years Eve in 1872. The church was restored and its basement still includes gravestones. Getting to yes hasn’t been easy for Jeffers. 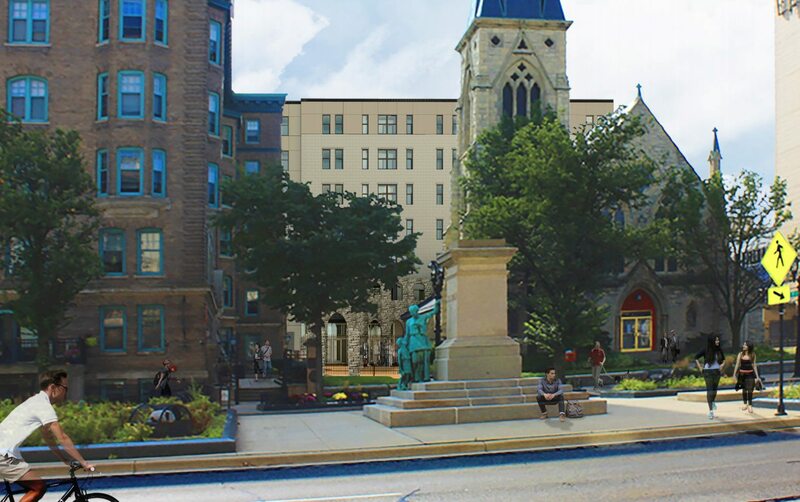 He admittedly rushed the project to the approval stage in late 2017, hoping to secure approval of the project plans in advance of the federal tax overhaul that could have eliminated the historic preservation tax credit program. The commission held the project, and luckily for Jeffers, the credits were preserved in the final legislation. A similar issue at the state level was recently resolved. The bigger challenge with getting commission approval is the nature of the city’s historic preservation ordinance. The ordinance does not allow for the Historic Preservation Commission to consider economic hardship as a factor in making their decisions. The ordinance stipulates the commission can deny demolition requests and grants the right for applicants to appeal to the Common Council. The council is able to consider the economics of the proposal in their decisions and has overturned commission denials as recently as last month. At the February meeting, two commission members, Ald. 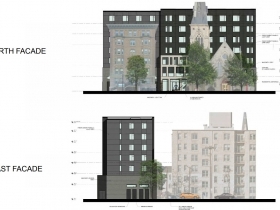 Robert Bauman and Ann Pieper Eisenbrown, ultimately voted to reject the demolition request. Pieper Eisenbrown said that since the commission couldn’t consider economic arguments the project didn’t satisfy the ordinance’s requirements for demolition. Commissioners Jarosz and Marion Clendenen-Acosta voted for Jeffers’ proposal and said they had to consider economic factors in this proposal. With Keating Kahn absent, the commission deadlocked. 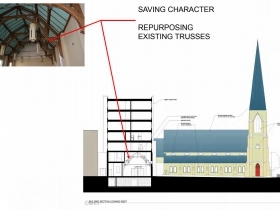 But she was in attendance Monday afternoon and after a presentation by the city’s historic preservation staff, motioned to approve the demolition with the conditions that the north facade and trusses from the parish house be preserved and that all stained glass windows inventoried and installed in the new building, The motion passed unanimously. Then after a lengthy debate, the commission also unanimously approved the designs of the new building. The approved motion requires that Jeffers and his team meet with the commission staff to examine material choices for the building’s facade and explore slight design changes to the new building’s top floor. The developer will instead make parking available for residents in the 452-stall parking garage at 633 W. Wisconsin Ave. Jeffers acquired the 20-story building and attached garage in December for $16.2 million. The apartments will be leased to undergraduate and graduate students, as well as young professionals, according to Jeffers. 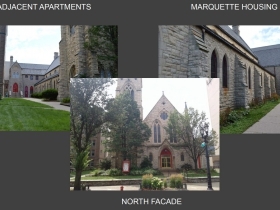 The complex is just east of Marquette University‘s campus and borders Marquette’s Straz Tower residence hall. Capitalize “protestant” in the 4th paragraph. I hope the project works out. Glad this was finally approved.